Defending champion Big Buck’s heads 35 entries for the £260,000 Grade One Ladbrokes World Hurdle, which takes place on day three of The Festival, Thursday, March 18. Paul Nicholls’ charge defeated the Nicky Henderson-trained Punchestowns to win the 2009 renewal of the three-mile contest and has been in great form this season, winning the Grade Two Long Distance Hurdle from Lough Derg and the Grade One Long Walk Hurdle from Karabak, both at Newbury. Nick Williams has entered the much-vaunted Diamond Harry, who was third in the Long Walk Hurdle on December 29, while the progressive Willie Amos-trained Lie Forrit also has an entry after impressing with handicap victories at Cheltenham and Newbury this season. The Henry Daly-trained Mighty Man was runner-up to the great Inglis Drever in the 2007 Ladbrokes World Hurdle and filled that same berth behind Big Buck’s in the Grade One John Smith’s Liverpol Hurdle at Aintree last term, before winning a novice chase at Hereford in December. A 12-strong Irish entry features the Edward O’Grady-trained Torphichen and the same trainer’s Grade One victor Jumbo Rio, as well as the Mouse Morris-trained 2006 totesport Cheltenham Gold Cup hero War Of Attrition. Cape Tribulation has been entered by Malcolm Jefferson and the trainer is considering his options for the talented permormer, who has also holds an entry in the Smurfit Kappa Champion Hurdle two days earlier. The six-year-old was fifth over the course and distance behind Weapon’s Amnesty in the Grade One Albert Bartlett Novices’ Hurdle at last year’s Festival, but has competed admirably over shorter trips this term. After finishing second to Zaynar in the Grade Two Unicoin Homes Relkeel Hurdle over two and a half miles at Cheltenham in December, Cape Tribulation showed up for a long way before coming home fourth behind Go Native in the two-mile Grade One Christmas Hurdle at Kempton on Boxing Day. Jefferson revealed today: “He is in the Smurfit Kappa Champion Hurdle as well as the Ladbrokes World Hurdle, so we will run him in the Champion Hurdle Trial at Haydock on Saturday, all being well, and then consider our options after that. Jefferson’s charge is a half-brother to smart Pattern race performers on the Flat, Germano and Moon Soitaire, as well as triple Welsh Champion Hurdle winner Potentate. That breeding and the gelding’s recent performances have caused the Malton trainer to consider Cape Tribulation’s options more closely. He commented: “In his breeding, on the dam’s line, there have been some good Flat horses that have been mile and a quarter horses, and Martin Pipe had a very good half-brother, Potentate, who was definitely best over two miles. “Cape Tribulation doesn’t lack speed, although we know he has stamina as well. It crossed my mind, as I sat recently and watched last year’s races at Cheltenham and Liverpool, that we were sitting pretty handy with him over a trip, so maybe it would be better dropping him in a bit. I would like to see how it would work, so we could try something like that at Haydock and see what speed we have. “He’s such a good jumper. At Cheltenham in December, he was unfortunate against Zaynar because Golan Way unseated early on and our lad jumped himself to the front - we didn’t really learn anything. Then at Kempton he ran a hell of a race but we were always chasing the one making the running. We acted a bit as pacemaker for the others and maybe he just did a bit too much then and didn’t find. Other notable entries include 2008 Smurfit Kappa Champion Hurdle winner Katchit and the same season’s Grade One Weatherbys Champion Bumper hero Cousin Vinny, as well as the high-class but unpredictable Tidal Bay from the Howard Johnson yard, victorious in the Grade One Irish Independent Arkle two years ago. Class 1, Grade One, £260,000 Total Prize Fund, three miles. Cheltenham, 3.20pm, Thursday, March 18. For four-year-olds and upwards which are allotted a rating of 130 or more by the BHA Head of Handicapping following a review of the horses entered and after taking account of races run up to and including March 11 - horses which are not qualified for a rating in GB, IRE or FR may also be entered (such horses may be eligible providing the Handicapper is satisfied that the horse’s racecourse performances up to and including March 11 would merit a minimum rating of 130 – the decision of the BHA Head of Handicapping shall be final), three miles. Weights: 4yo: 11st 1lb; 5yo+: 11st 10lb; fillies & mares allowed 7lb. Entries closed January 19, entries revealed January 21 (35 entries). Scratchings deadline February 16, £13,000 supplementary entry stage & six-day confirmation stage March 12, final declarations 10am, March 16. Form figures supplied by Weatherbys and are correct up to and including the racing of Tuesday, January 19. 4. The Ladbrokes World Hurdle used to be a favourite with the Irish, who have won it nine times, most recently in 1995 with Dorans Pride. Baracouda provided a first success for France in 2002 and followed up again in 2003. In 2004 and 2005, he was runner-up behind Iris’s Gift and Inglis Drever respectively, while in 2006 he ran fifth behind My Way De Solzen. Baracouda’s trainer Francois Doumen also saddled Kasbah Bliss to finish second in 2008 and fourth last year when starting the hot 10/11 favourite. 5. 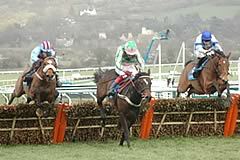 In 2008, Inglis Drever created history by becoming the first horse to win the contest three times. He was successful in 2005, missed the 2006 race due to injury before returning to land both the 2007 and 2008 renewals. 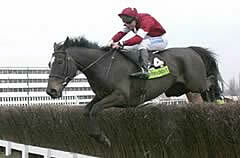 There have been three dual winners - Crimson Embers (1982 & 1986), Galmoy (1987 & 1988) and Baracouda (2002 & 2003). 8. No horse has managed to win both the Smurfit Kappa Champion Hurdle and the Ladbrokes World Hurdle. 9. A total of 11 favourites have been successful. 10. The smallest field to go to post was eight in 1973 while the largest was 22 in both 1985 and 1990. 14 ran last year and current safety limit is 24. 11. Tommy Carberry, Stuart Shilston, Tommy Carmody, Mark Perrett, Charlie Swan, Jamie Osborne and Thierry Doumen are the most successful jockeys, each recording two victories. No current jockey has won the race more than once. The three-time winner Inglis Drever was partnered by different jockeys for each of his victories – Graham Lee (2005), Paddy Brennan (2007) and Denis O’Regan (2008).